United Says Goodbye To Its Iconic 'Queen Of The Skies' Early commercial showed passengers eating steak dinners, sipping cocktails, watching movies and freely moving around inside the twin aisle, wide body fuselage. 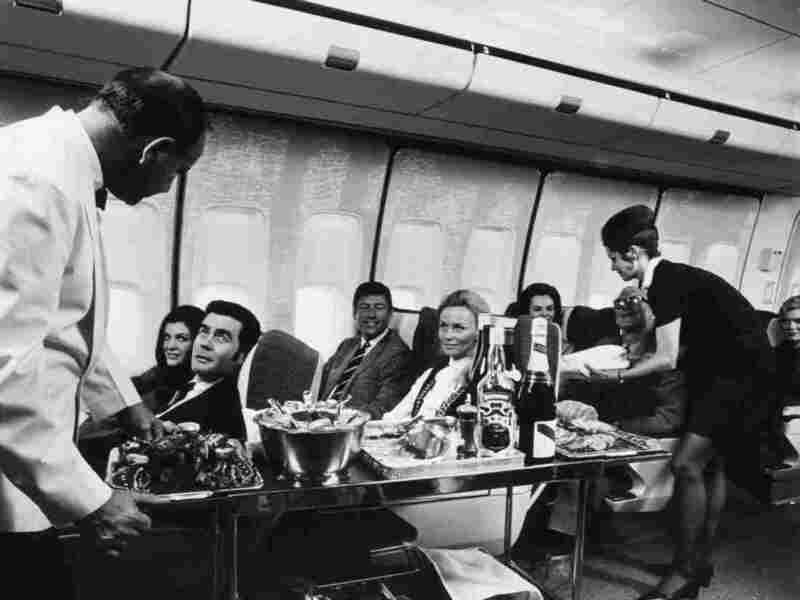 A steward and stewardess serving first-class passengers with drinks and refreshments on board a Boeing 747 in 1970. It's the end of an era in domestic commercial aviation Tuesday, as United Airlines flies the iconic Boeing 747 one last time. The flight from San Francisco to Honolulu recreates the airline's first trip taken by the "Queen of the Skies" back in 1970, which helped usher in a golden age of commercial airline flight. Back when our TV screens were small and needed tubes to show a picture, commercials showed off the new aircraft from Boeing that would revolutionize air travel. The first Boeing 747 rolled out of the company's plant Washington state in September 1968 before the world's press and representatives of the 26 airlines that had ordered the plane. "Chances are, you've heard about the plane with the spiral staircase in first class, the plane with the two wide aisles and the three wide screen movies and the eight foot ceilings in economy," said the narrator of a vintage 1969 ad for Pan Am Airways, which would be the first airline to fly the 747. Another called the 747 a "superjet," and "the plane that's a ship, the ship that's a plane." The commercials showed passengers eating steak dinners, sipping cocktails, watching movies and freely moving around inside the twin aisle, wide body fuselage. 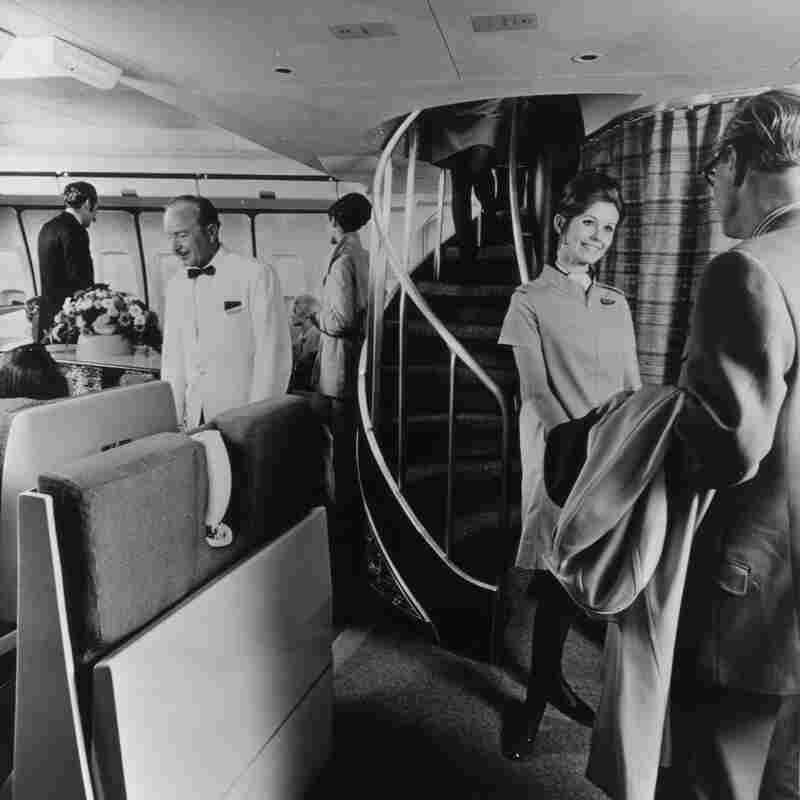 "And then of course, that really exclusive opportunity to go up that spiral staircase in those first 747's and go into that upper deck lounge," says Boeing company historian Michael Lombardi, who added that few had ever experienced amenities anything like this before in flight. "(It was) an experience that was a very singular experience in air travel." But Lombardi says it wasn't just the luxuries that made the 747 a game changer. It was twice the size of what at the time was the biggest airliner in the world, the Boeing 707, and it had a much longer range than its predecessor planes. That size and range meant it could economically carry hundreds more passengers much longer distances non-stop. "For the first time in history, anybody in the world could get on an airplane and fly anywhere," Lombardi says. "That's what the 747 did; it gave wings to the world." "To me, it was just the spaciousness of the aircraft," says 89-year old Bill Klint, who loved the 747 in its early days and is taking that final United flight today. You get in there, and you can sit back, it was like being in the living room. "You get in there, and you can sit back, it was like being in the living room," he adds. Klint wasn't just a fan of the plane, but as an engineer for then rival airplane maker Lockheed, he had a deep appreciation for its design. "You look at the exterior and think about what it takes to make that thing stay in the air... and the fuel capacity and passenger arrangement and all this other stuff for design, Klint says. "It was unusual and beautiful." "You really have no idea how big the airplane is behind you when you're flying it from the cockpit," says Capt. Tom Spratt, who is one of the United pilots making the final voyage. He recalls the first time he flew a 747, some 17 years ago. "When I walked outside and looked off the boarding stairs at 231 feet of airplane ... and to realize just how huge the airplane was, it was pretty amazing." 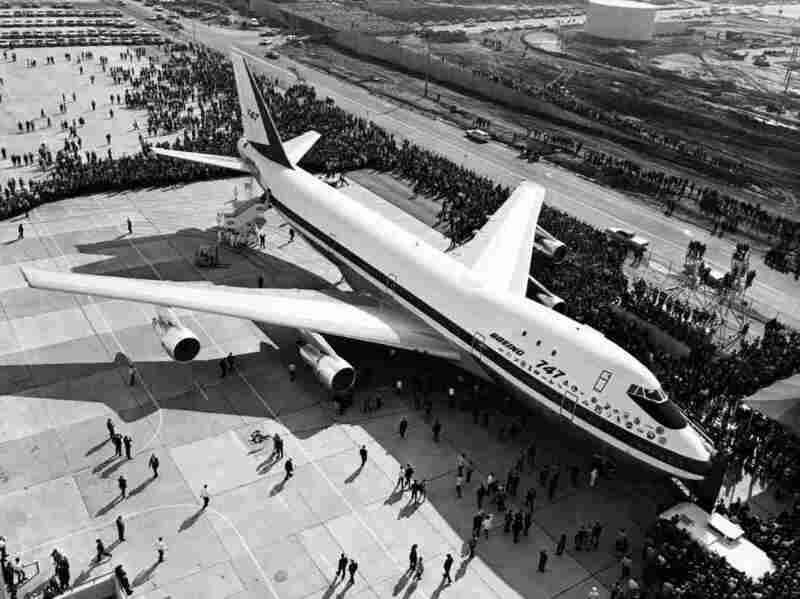 Historian Michael Lombardi says when it first rolled off Boeing's assembly line, "it was so big, that a lot of people, literally thought there's no way it could get off the ground." But he says the plane's newly developed engines, called high bypass engines, gave the plane plenty of lift and speed. "So it was a real engineering feat." Boeing actually didn't think the 747 would last long as a passenger plane and thought its real future was for carrying freight. "To be a good freighter, they would want to load freight through the front of the airplane," says Lombardi. To facilitate that, designers needed to get the flight deck out of the way, he says, so they put the flight deck on the top of the airplane. "And with that, the 747 got its distinctive hump." "It makes it the most recognizable commercial jet in the world," says Lombardi, adding that it demonstrates that "there is art in good engineering." "The minute you get on board, you heard the Hawaiian music and actually the crew was all dressed in native garb so to speak," says Klint. "No prissy uniforms or anything ... man, you knew you were bound for Hawaii." "I do get jealous sometimes, absolutely," says Klint's 31-year old nephew, Matthew, who is joining him on Tuesday's final United 747 flight. The airline is recreating a 1970s vibe on its final bound trip, which retraces United's first 747 flight from San Francisco to Honolulu. It'll include retro uniforms, 1970s music, and a 1970-inspired menu. Matthew Klint is looking forward to enjoying a few hours in an air travel era he is too young to have lived, but he calls the final United 747 voyage, "bittersweet." As a travel industry consultant who flies more than 200,000 miles a year, and author of the "Live and Let's Fly" blog, Klint recognizes that since its inception, the 747 has been "the most iconic and most beautiful aircraft in the sky." "The 747 has taken me all around the world, to Asia, to Australia, to South America, to Africa," he adds, "and it's been a wonderful aircraft." But with four engines, the 747 isn't nearly as fuel efficient as modern twin engine planes. And airlines nowadays try to better manage seat capacity and would rather not have to sell so many seats, preferring Boeing's 777 and 787 or Airbus' A350 and A330 when buying new widebody jets. The 747 could be configured to carry 375 - 475 passengers or more, depending on the model, while the 777 can carry 315 to 390 travelers, and the 787 holds 250 - 330 passengers. After today, Delta will be the only U.S. airline flying a 747, and it plans to retire the plane before the end of the year. But this isn't completely the end of the line for the Queen of the Skies. British Airways, Korean Air and a few other international airlines still fly 747s, and its widely used for freight. In fact, new freighters are still being built. And the president of the United States still flies on one. In fact, Boeing is designing and building new Air Force One versions of the 747 that are expected to be put in service in 2024.